BEATTY — Environmentalists are taking over this faded mining town 120 miles northwest of Las Vegas, but many locals don’t seem to mind. The Nature Conservancy is now the largest private landowner in this part of Nye County, where the national environmental group is working with local residents to recast the area as a preserve for sensitive desert wildlife and a destination for outdoor enthusiasts. 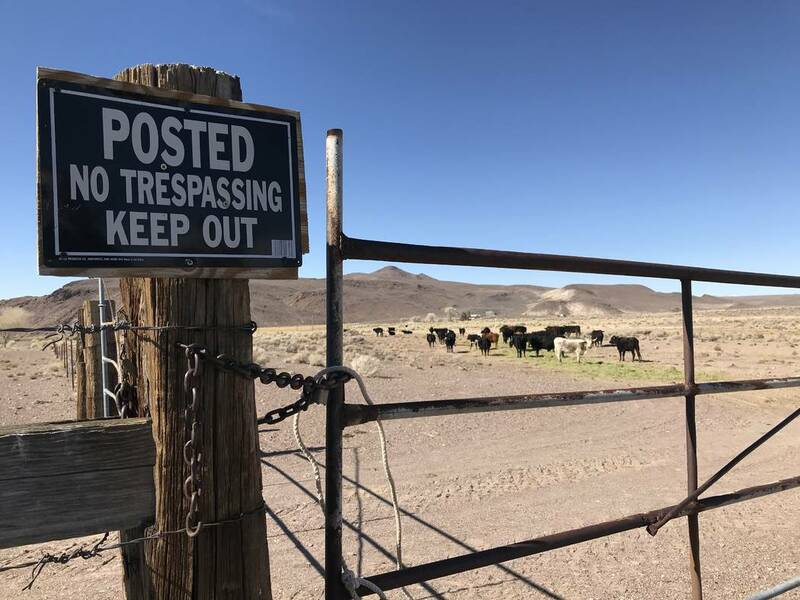 The conservancy closed on its latest acquisition Wednesday: a working, 900-acre cattle ranch at the headwaters of the Amargosa River north of Beatty that could one day become a living laboratory for conservation work, though ranching will continue. The $2 million purchase more than doubles its already extensive holdings along the lush ribbon of riparian habitat known as the Oasis Valley. “I don’t have a concern with that like I might have 10 years ago, because they’ve demonstrated they’re willing to work with us. That’s important to us,” said David Spicer, one of the conservancy’s neighbors near Beatty. Spicer is a rancher, miner and businessman who has lived in the Beatty area nearly all his life. 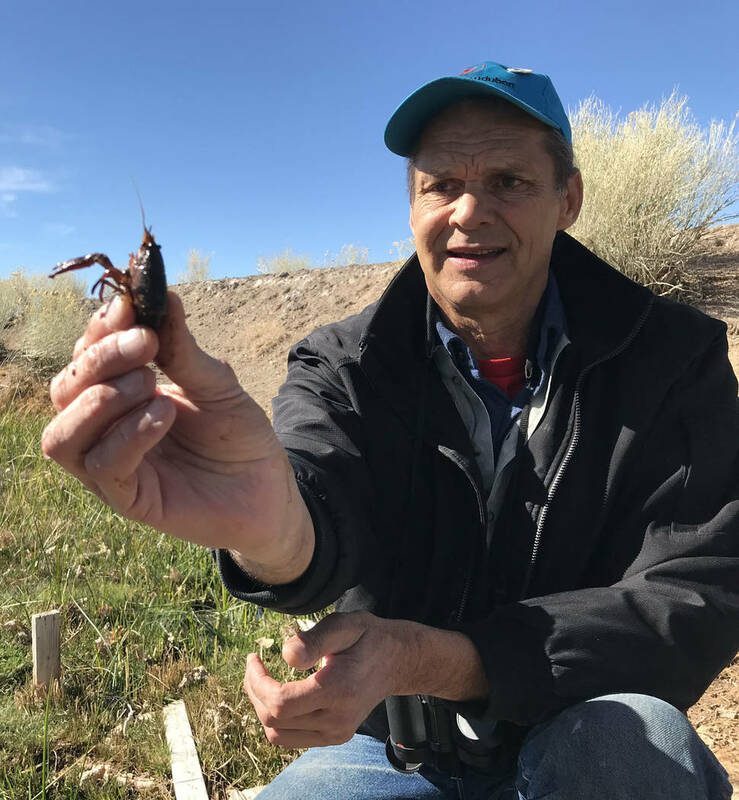 He’s also the leader of a local, decades-long campaign to protect the native Amargosa toad and keep it off the endangered species list. He said the Nature Conservancy has been an important partner from the beginning. “We’ve had a relationship with them for more than 20 years now,” said Spicer, who heads a nonprofit of his own: Saving Toads thru Off-Road Racing, Ranching & Mining in Oasis Valley or STORM-OV for short. As a result of the grassroots effort in Beatty, much of the rare amphibian’s habitat along the river has been protected without cutting off access to the land or burying local residents in red tape, Spicer said. 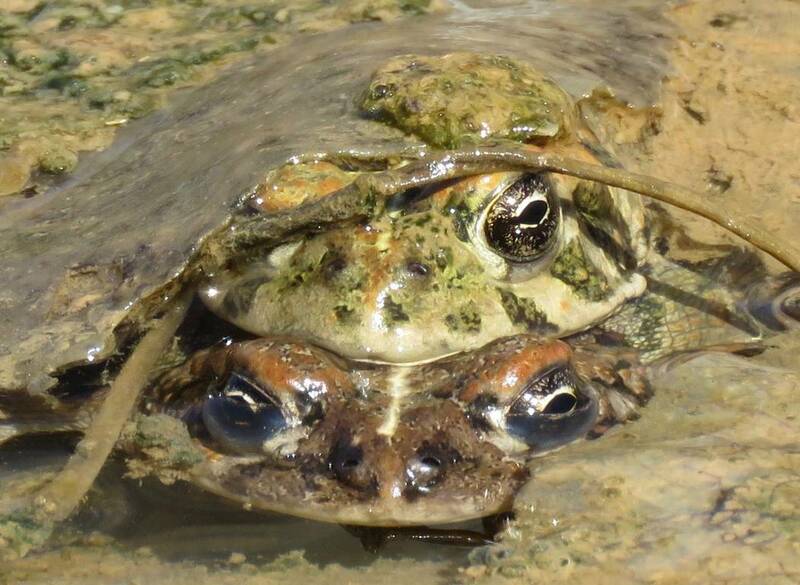 The toad population is now considered healthy and stable, with numbers in the thousands. Through purchase or donation, the conservancy has acquired 8 parcels totaling more than 1,600 acres in and around Beatty since 1999. The group has mostly avoided the sort of backlash environmentalists often face in rural Nevada by being a good neighbor, said Ryan Tweney, who retired to Beatty 14 years ago and now chairs the town’s library board. And it doesn’t hurt that the nonprofit organization insists on paying taxes on its holdings, the way any other private landowner would, he said. The conservancy’s newest property in the area could be the most important, said John Zablocki, Southern Nevada conservation director for the group. 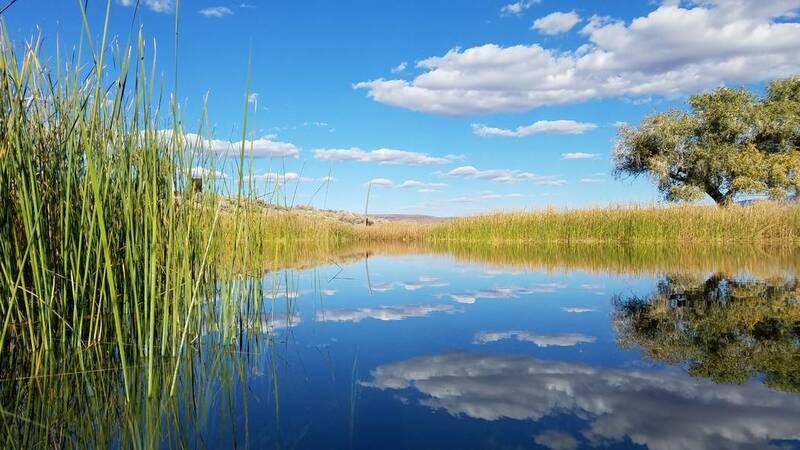 Tucked away behind the hills northeast of U.S. Highway 95, the 7J Ranch is dotted with ponds, wet meadows and rich pastureland fed by more than a dozen springs. The ranch is bracketed by Joshua trees on one side and sagebrush on the other, marking the transition zone between the Great Basin and the Mojave Desert. Len Warren, Amargosa River project manager for the conservancy, has lots of ideas for the 900-acre spread. 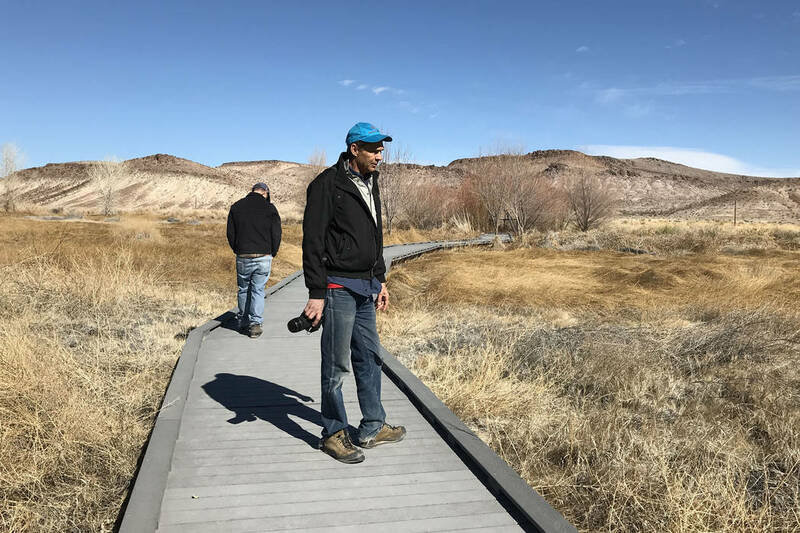 As he walked around the property on a recent Friday, he pointed out where native trees could be planted to to provide bird habitat or where a pond stocked with bass might be converted into a safe haven for the Amargosa toad and endemic springfish like the Oasis Valley speckled dace. Zablocki pictures the ranch as a research station, where scientists from the conservancy and elsewhere can conduct real-world experiments on private land without having to go through lengthy federal regulatory reviews. “We could try out solutions on our own property,” he said. Some things won’t change at the 7J. Zablocki said the property will continue to house a livestock operation, with the previous owner running cattle there under a lease with the conservancy. Longtime Nevada rancher Hank Brackenbury said he bought the 7J about four years ago. “Poverty” is what persuaded him to sell the place to the environmental group, he said. “I had a pretty big ranch payment,” he said. This way, he gets to keep raising beef cattle on the land, and the Nature Conservancy gets a crash course in ranching from someone who knows a thing or two. The purchase price included grazing rights on 280,000 acres of federal land surrounding the ranch, much of it unfenced and bordered by a massive Air Force bombing range to the east. The property is also within sight of Yucca Mountain, proposed repository site for the nation’s high-level nuclear waste. “I tell everybody, ‘I live closer to Yucca Mountain than anyone. I’ll be the first to glow,’” Brackenbury said. There are about 75 head of cattle on the property right now, he said, but the range can handle more than twice that amount when conditions are good. 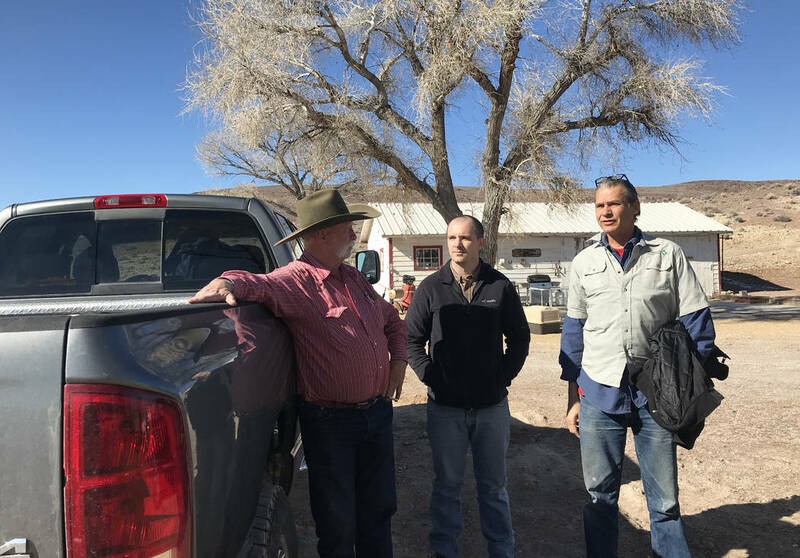 Zablocki said the conservancy’s new pastures also could serve as a regional “grass bank,” providing relief forage for other Nevada ranchers stricken by wildfire or drought. “We actually need grazing as a rangeland management tool,” he said. Zablocki said this should be the conservancy’s last big purchase in the Beatty area for a while. 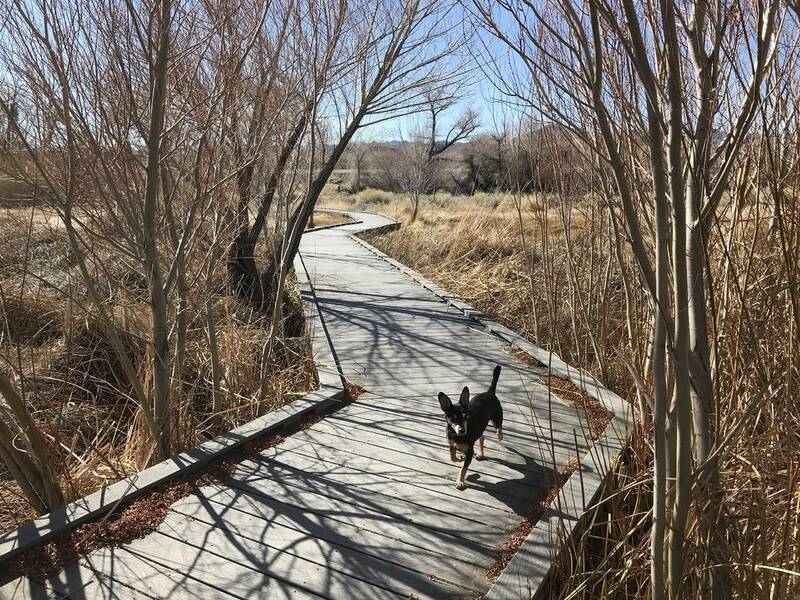 To that end, the organization is working with a prominent local business owner on a dog park and trail system that will lead visitors down to the Amargosa River from the edge of his parking lot. Warren and company also have plans for more boardwalks, signs and native trees at the Torrance Ranch Preserve, the conservancy’s oldest habitat restoration project in the area. The broader goal, one shared by the conservancy and locals like Spicer, is to find something new to sustain a once-proud hard rock mining town that’s fallen on hard times. Ecotourism could be the answer. 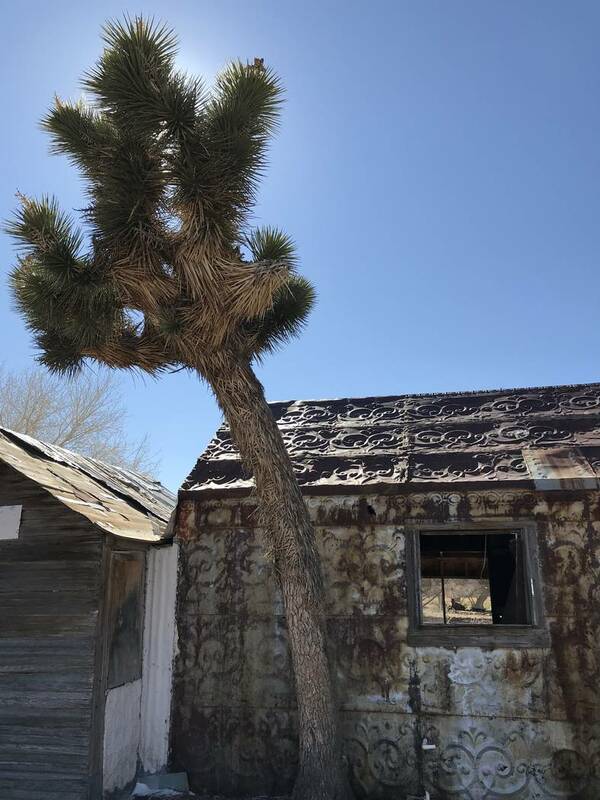 Warren said Beatty, which is home to fewer than 1,000 people, already serves as a gateway community of sorts for nearby Death Valley National Park. “We want to entice people to stay a little longer and come back again,” he said. Spicer has invested heavily in that idea. Over the past five years, he has developed more than 50 miles of mountain bike trails on his ranch and the surrounding public land, and he’s taken to hosting events ranging from Boy Scout campouts to scaled-down versions of Burning Man. Ultimately, he sees what he’s doing as a way to help the environment and the economy in his beloved valley. For a guy with a vague job title, State Engineer Jason King has been involved in some pretty important decisions for Nevada. During his eight years as the state’s top water regulator, he banned new residential wells in Pahrump, blocked water development for the long-stalled Coyote Springs master-planned community and twice ruled on controversial plans to pipe groundwater to Las Vegas from eastern Nevada. The 57-year-old King retired Friday after a 28-year career as a state employee, including the last eight as state engineer and administrator for the Nevada Division of Water Resources. Bradley Crowell, director of the Nevada Department of Conservation and Natural Resources, has appointed King’s current deputy administrator, Tim Wilson, as acting state engineer. Wilson has been with the Division of Water Resources since 1995. He will inherit several major ongoing water issues, including pending court challenges of King’s most recent actions regarding Pahrump, Coyote Springs and the Southern Nevada Water Authority’s in-state pipeline plans. Though it might not be obvious from the title, the state engineer is responsible for the appropriation and regulation of all water within the state, except for the Colorado River. The position includes oversight of water well drilling, dam safety, water planning and floodplain management. In 2012, King granted the water authority some of the groundwater it wants to tap in rural Clark, Lincoln and White Pine counties. Then last year, he rescinded those same water rights because of a 2013 court ruling he said he disagreed with but was legally bound to follow. That decision is now under appeal, as are two other contentious orders he issued since 2017 barring new domestic groundwater wells in Pahrump and prohibiting more pumping by the developers of Coyote Springs. In both of those cases, King said he was acting to protect existing well owners and water levels in aquifers he considered to be severely over-appropriated. King was born and raised in Albuquerque, New Mexico, where he earned a degree in civil engineering in 1986. He moved to Las Vegas in 1988 and went to work for the Division of Water Resources in 1991, after three years of structural design work in support of underground nuclear testing at what was then known as Nevada Test Site. When interviewed for a profile in 2011, he told the Review-Journal that he didn’t know anything about Nevada water law when he took the job, but he came to “live and breathe” the subject as he rose through the division’s ranks to state engineer in 2010. “I am grateful for Jason’s service to Nevada and his steadfast leadership to thoughtfully managing our precious water resources,” Gov. Steve Sisolak said in a written statement. “I am confident Tim Wilson will continue the direction and progress established under Jason’s leadership on the many critical water issues and policies that affect all Nevadans. When Pastor Victor Fuentes escaped Fidel Castro’s dictatorship for the United States, he expected to find the Land of the Free, where, unlike communist Cuba, the government respects and protects private property. Unfortunately, the United States Fish & Wildlife Service (“FWS”) ruined the American Dream for him and his congregation. Ministerio Roca Solida Iglesia Cristiana is a small, mostly Spanish-speaking, congregation in Las Vegas.1 Led by Pastor Fuentes and his wife Annette, the church has been fighting for seven years to stop FWS from repeatedly flooding its camp located in rural Nevada and to return its water. Tragically, FWS turned Patch of Heaven into a living hell. Since at least the 1880s, the property was served by two spring-fed streams. In addition to watering the camp’s wetlands and filling its swimming pond, the streams supplied and served as baptismal waters of special significance to the church. It provided, “an oasis soothing to the soul and an ideal setting upon which to reflect upon God and His word,” says Pastor Fuentes. Ministerio Roca Solida also used Patch of Heaven for retreats and youth camps. In particular, Pastor Fuentes brought troubled youths from Las Vegas to the camp to help turn their lives around, as well as adults suffering from drug and alcohol addiction. U.S. Army Corps of Engineers, or following the mandates of the National Environmental Policy Act, FWS undertook a project which diverted the streams around the camp from their long historical route through the Patch of Heaven. FWS justified its actions under the pretense of “stream restoration” and creating faster moving water for a minnow called the speckled dace. $90,000. Despite FWS’s initial argument that the flood was an unpredictable 100-year occurrence, the Camp flooded three more times in a short period, bringing the property damage total to over $225,000. In addition to damaging the property through the flooding, the diversion project significantly reduced the property value, not only through loss of the historical desert spring-fed streams through the property, but also because of the constant threat of flooding that resulted from the negligent work on the diversion project. Because of FWS’s faulty construction of the diversion channel, which was never engineered to accommodate rain or runoff waters, a mini-Grand Canyon now cuts through what was once lush wetlands. Not only does FWS refuse to pay for the damage it has caused or restore the stream so that the church can enjoy its water rights, but it blatantly refuses to fix the diversion channel. After four floods, the church is under constant siege, making any effort to rebuild or restore the damage futile. What makes this tragedy even worse is that FWS’s refusal to fix its mistakes is not due to bureaucratic incompetence or red tape. As all-too-many property owners in the West understand, when the federal government doesn’t want you as its neighbor, it will force you out by any means necessary. 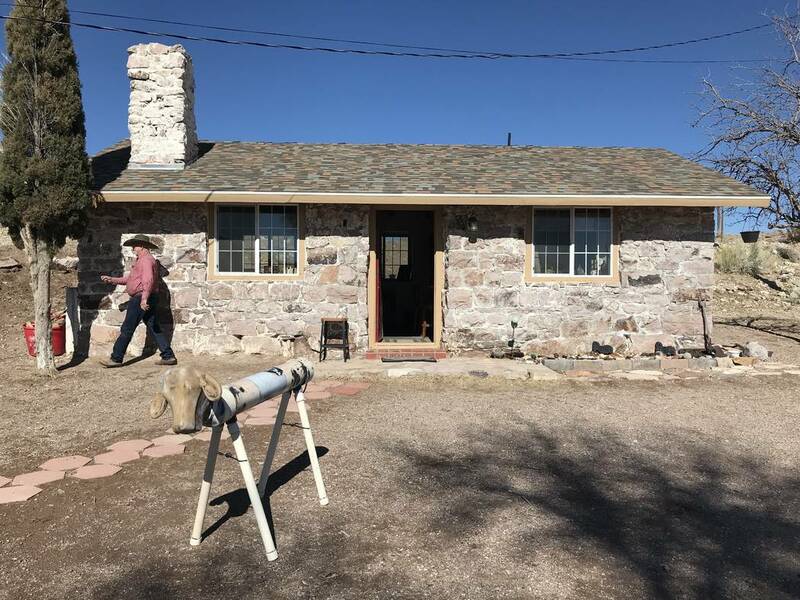 Mountain States Legal Foundation is now representing Ministerio Roca Solida to hold the federal government accountable for its unconstitutional theft of the church’s property. in the United States of America offer the chance to change lives. Together with his wife Annette, he has fought to protect his church from his own government. On February 21, 1991, in an attempt to escape the Fidel Castro dictatorship and secure medical help for his ailing Cuban mother, Victor Fuentes swam nearly seven miles from Santiago, Cuba, to Guantanamo Bay Naval Base to secure political asylum in the United States. Political asylum was granted to Mr. Fuentes, and he was placed in Las Vegas, Nevada. Not long thereafter, in exchange for promises to secure his ailing mother’s safe transport from Cuba, Mr. Fuentes became involved with an illicit drug distribution scheme operated by former Cuban nationals in the Las Vegas area. Rather than landing his ailing mother in the United States, Pastor Fuentes involvement in the drug distribution scheme landed him in federal prison for a period of three years. It was, however, during this time, that Mr. Fuentes was exposed to religious materials for the first time (having been denied such freedoms in Castro’s Cuba), and turned his life around in a most dramatic way, even while still in federal prison. Upon his release, Mr. Fuentes became an ordained minister and used his remarkable story change lives—initially as a youth minister in Las Vegas, and eventually, with the assistance of his wife, Annette, he formed Ministerio Roca Solida in Las Vegas. Ministerio Roca Solida grew to a congregation of more than 70 churchgoers. In 2006, a parishioner left the church $500,000 from her estate, which it used to purchase Patch of Heaven. Despite the wicked treatment his government has forced him and his church to endure, Pastor Fuentes refuses to give up. When the church was out of funding to pay its legal bills, Pastor Fuentes took a job at a local dairy to raise money. The U.S. Fish & Wildlife Service is not simply being a bad neighbor. It is illegally and unconstitutionally stealing the church’s water and its protected property rights. The Fifth Amendment to the United States Constitution provides, in pertinent part, “nor shall private property be taken for public use, without just compensation.” U.S. Const. Amend V. Known as the “Takings Clause,” this entitles property owners to compensation when the government takes private property for roads, schools, and other public purposes. The Fifth Amendment also prevents the government from flooding private property without compensating property owners for the invasion. In 2012, with the assistance of a local organization called the Nevada Policy Research Institute, the church first filed its lawsuit against the federal government for damages. Due various procedural quirks, it had to file two lawsuits to assert all of its claims, one in the U.S. District Court for the District of Nevada, and one in the U.S. Court of Federal Claims (“CFC”). The church fought a jurisdictional question regarding the two separate lawsuits for almost 5 years until the U.S. Supreme Court denied review and the church was forced to file its current lawsuit in the CFC. In the meantime, the camp suffered three subsequent floods after the initial disaster. Ministerio Roca Solida is represented by Mountain States Legal Foundation Attorney Christian B. Corrigan. A native of Wichita, Kansas, Christian clerked for Justice Caleb Stegall on the Kansas Supreme Court. Prior to joining MSLF, Christian worked at the Institute for Justice in Arlington, VA and the Federalist Society for Law & Public Policy Studies in Washington, D.C. He is a graduate of the University of Pennsylvania and the University of Kansas School of Law. 2 Lingle v. Chevron U.S.A. Inc., 544 U.S. 528, 537 (2005) (citations omitted). 3 United States v. Kansas City Life Ins. Co., 339 U.S. 799, 809 (1950); United States v. Lynah, 188 U.S. 445, 470 (1903) (“Where the government by the construction of a dam or other public works so floods lands belonging to an individual as to substantially destroy their value, there is a taking within the scope of the 5th Amendment.”). 4 Arkansas Game & Fish v. United States, 568 U.S. 23, 32 (2012). 5 Moden v. United States, 404 F.3d 1335, 1343 (Fed. Cir. 2005). 8 See, e.g., Brandt v. United States, 710 F.3d 1369 (Fed. Cir. 2013); Laguna Gatuna, Inc. v. United States, 50 Fed. Cl. 336 (Fed. Cl. 2001); Mountain States Legal Foundation v. Hodel, 799 F.2d 1423 (10th Cir. 1986); Dolan v. City of Tigard, 512 U.S. 374 (1994) (amicus curiae); Lucas v. South Carolina Coastal Council, 505 U.S. 1003 (1992) (amicus curiae); Casitas Mun. Water Dist. v. United States, 543 F.3d 1276 (Fed. Cir. 2008) (amicus curiae). 9 cable Trust v. United States, 572 U.S. 93 (2014); Adarand c., v. Pena, 515 U.S. 200 (1995). On Nov. 8 a Nevada district court judge ruled that Nevada State Engineer Order #1293(A) be rescinded and now, a month later, the court order making that ruling official has been signed and filed. However, the fight is far from over, with the receipt of the court order by the state engineer’s signaling a 30-day period in which it can file an appeal over that decision. According to office representatives, the engineer does indeed plan to seek an appeal and Pahrump residents will have to bide their time once again as they wait to see the ultimate result of this battle of the engineer’s office versus area property owners, well drillers and real estate agents. “Given the significant potential impact of the court’s ruling on all Nevada water users, the state engineer intends to appeal the District Court’s decision to the Nevada Supreme Court and to simultaneously seek a stay of the decision,” Nevada Department of Conservation and Natural Resources Public Information Officer JoAnn Kittrell stated when reached for comment on behalf of the state engineer’s office. Order #1293 was issued by Nevada State Engineer Jason King in Dec. 2017, following a request for such action by the Nye County Water District Governing Board. The order restricted the drilling of domestic wells in Pahrump’s Basin #162 by requiring that all new domestic wells have at least two acre-feet of water rights relinquished to the state in support of the well, prompting a wave of criticism and concern in the valley. Shortly after the initial order was signed off, Pahrump residents and property owners banded together to form Pahrump Fair Water LLC, which immediately filed suit to challenge the engineer’s order. Six months after the original order, an amended version, Order #1293(A), was issued and the state engineer’s office attempted to have Pahrump Fair Water’s lawsuit thrown out, arguing that Order #1293(A) superseded Order #1293 and therefore the lawsuit was moot. However, Pahrump Fair Water was not about to let this create a stumbling block and the group, represented by attorney Dave Rigdon of Taggart and Taggart LTD, entered into a settlement agreement with the engineer’s office in which the suit against Order #1293 was dropped and a new petition was filed against Order #1293(A). In return for this action, the engineer’s office agreed to an expedited case schedule. On Nov. 8 district court Judge Steven Elliott ruled in favor of Pahrump Fair Water and tasked Rigdon with drafting the court order that would effectively rescind Order #1293(A). Rigdon submitted his draft to the courts on Nov. 21, but his was not the only version for the judge to consider. Rigdon explained for the Pahrump Valley Times that the state engineer’s office disagreed with the language of Rigdon’s proposed order and had decided to take what Rigdon described as a “rather unusual step” by submitting a proposed order of its own. In the end, however, it was Pahrump Fair Water’s proposal that judge Elliott put his pen to and signed off on Dec. 3. The document was officially filed on Dec. 6. In the 10-page court order, Rigdon outlines Pahrump Fair Water’s stance that the state engineer’s office overreached its authority and violated constitutional due process by its lack of notice to affected parties. Furthermore, the court order details that Order #1293(A) is not supported by any substantial evidence. “The Nevada Supreme Court has ruled that prior to issuing a regulation affecting an interest in real property, a regulatory body must provide personal notice to each affected property owner,” the document continues. “Said notice must include the content of the regulation so that affected parties can adequately prepare to oppose it. Finally, the regulatory body must hold a hearing and allow affected property owners the opportunity to provide testimony and evidence related to the regulation. “A failure to follow these steps is a constitutional due process violation that renders the regulation invalid. Because the orders impair a vested property right, and because the state engineer failed to provide notice or hold a hearing before issuing the orders, the orders are hereby deemed invalid,” document also said. The engineer’s office argued against each of these claims during the hearings held in the matter but to no avail. The court order states that the court determined that Pahrump Fair Water’s arguments to this effect were valid and the engineer’s office “arbitrarily and capriciously” issued Order #1293(A). Robin Hebrock/Pahrump Valley Times Court documents reversing Order #1293(A) are pictured. Signed by a district court judge on Dec. 3, the court order was filed with the Nye County Clerk’s Office on Dec. 6. 11-29-2018 Convincing the Nye County Sheriff that Water is Real Property and can be stolen and it is an actual theft and not just a civil dispute. Nye County residents Victor and Annette Fuentes have been embroiled in a longstanding battle over water with the U.S. Fish and Wildlife Service and now, Nye County officials are stepping in to request federal assistance for the couple. Nye County Sheriff Sharon Wehrly and Nye County Commission Chairman John Koenig sent a letter to the White House on April 5. 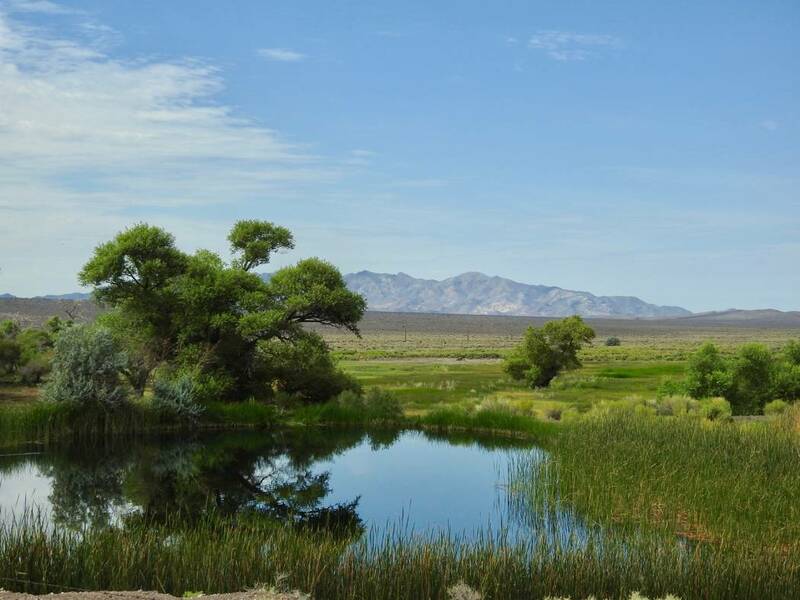 The letter requests direct intervention by President Donald Trump, asking him to address the situation and force the USFWS to return the water to the Fuentes’ 40-acre private property, Patch of Heaven Christian Camp, which is located within Ash Meadows National Wildlife Refuge. The problem all started almost eight years ago when the USFWS constructed a diversion channel that altered the course of water down the Carson Slough, ultimately redirecting the water flow away from the Fuentes’ property. Without the water, the Fuentes’ land began to dry up and their business of the Patch of Heaven Christian Camp, which is part of Ministerio Roca Solida Ingelsia Cristiana, started to suffer. Pahrump Valley Times Victor and Annette Fuentes stand in front of a flooded approach to their church camp in this 2007 file photo. The property has dramatically changed since then, due to U.S. Fish and Wildlife’s diversion of the natural water way that brought life to the Patch of Heaven property. Annette stated that throughout the years since the couple’s lawsuit was filed, the diversion has caused a frustrating mixture of dry, dusty conditions a majority of the time and periods of frightening flooding that damage the land and put a pinch on their business. However, fixing the situation is no easy task. The Fuenteses have been struggling to have the water fully restored to their property since 2010 and that effort is still underway. Those wishing to learn more about the situation will have the opportunity next weekend when the Patch of Heaven Rally and Open House is held. On April 20, 21 and 22 the refuge camp will open to the public and Ryan Bundy, who is running for Nevada governor this year, will host a “water rights summit” the first evening. Annette encouraged the public to attend. The U.S. 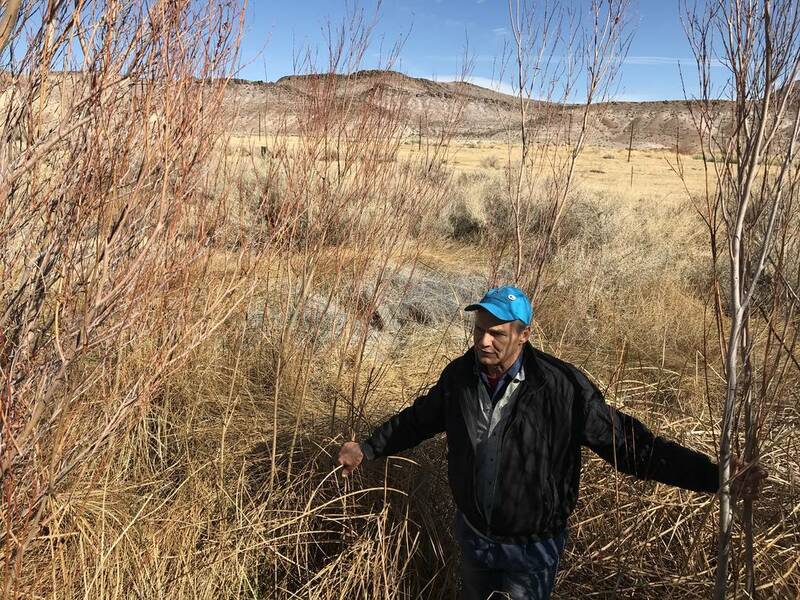 Fish and Wildlife Service restored the flow of a small portion of the water to the property owned by Ministerio Roca Solida in Amargosa Valley. In November, the state gave the Fish and Wildlife Service 90 days to return water to Ministerio Roca Solida, a private church ministry located in the Ash Meadows National Wildlife Refuge, after the investigation found several violations of the terms of the ministry’s water permits. The issue originated more than 6 ½ years ago when the Fish and Wildlife Service diverted the creek away from the Ministerio Roca Solida where Victor and Annette Fuentes, the leaders of the ministry, had founded the Patch of Heaven church camp. The agency cited the need to preserve endangered species, including the Ash Meadows speckled dace that inhabit the refuge. Joseph Becker, director of Nevada Policy Research Institute’s Center for Justice and Constitutional Litigation, who represents the Fuentes, issued a brief statement following the restoration of the creek. “While Pastor Victor Fuentes continues his legal fight to have the desert spring-fed stream and his church camp restored to its pre-unlawful diversion conditions, he nevertheless welcomes the trickle of water now returned to his property via a small pipe and solar-powered pump,” Becker said. Becker said that restoring a small trickle of water to the church’s property won’t fix the flood damage that has already occurred as a consequence of diversion of the water, nor will it prevent flood damage from occurring in the future. Despite no previous record of flooding, the church’s camp has been flooded four times since the Fish and Wildlife Service diverted a stream which, prior to 2010, had traversed the church’s private property since at least as early as the late 1800s. Becker repeatedly said that Fish and Wildlife officials moved the waterway without the requisite Clean Water Act permits being procured from the U.S. Army Corps of Engineers or approval from Nye County officials enforcing FEMA regulations. In depositions taken pursuant to the lawsuits waged by Nevada Policy Research Institute’s Center for Justice on the church’s behalf, government witnesses have already testified that the artificial channel into which they diverted water was never designed or built to accommodate the amount of water flow historically carried in the water’s former path, Becker said. The U.S. Fish and Wildlife Service Southern Nevada did not return requests for comment by press time. The U.S. Court of Federal Claims rejected the federal government’s attempt to dismiss a takings claim lawsuit for diverting water from Ministerio Roca Solida, a small church in Amargosa Valley. A ruling from America’s trial court for “takings” issues under the Fifth Amendment of the Bill of Rights has rejected arguments central to the federal government’s case. “Judge Kaplan’s decision is a very large step forward for the Patch of Heaven church camp in what has now become a five-year-plus court battle between the church and and the federal government,” Becker said. In 2010, the U.S. Fish and Wildlife Service diverted the creek away from the Ministerio Roca Solida where Victor and Annette Fuentes, the leaders of the ministry, had founded the Patch of Heaven church camp. The agency cited the need to preserve endangered species, including the Ash Meadows speckled dace that inhabit the refuge. The diversion also resulted in repeated flooding of the church’s property. The federal government had argued that it bears no liability for the flooding and that the church had no rights to the water that had previously traversed its property. Becker argued in the documents that the federal government violated multiple constitutional rights in one fell swoop in August 2010. The Ministerio Roca Solida has since filed a complaint for the tort and due process and free-exercise claims in the U.S. District Court for Nevada. In 2012, the church also filed a takings claim in the U.S. Court of Federal Claims, along with a motion to stay proceedings in that court pending the outcome of the injunctive relief sought in the U.S. District Court. The federal government argued before the Court of Federal Claims that the plaintiff could not pursue all its claims. The Court of Federal Claims held that the church could not bring a takings claim in the Federal Court of Claims while seeking relief for other government transgressions in the U.S. District Court. “Because of the federal agency’s dangerously negligent construction of the diversion channel, never competently engineered to accommodate rain or runoff waters, a mini-grand canyon now cuts through what were once lush wetlands,” Becker said. The Nevada Division of Water Resources recently said that Roca Solida Ministry had vested rights to the water. On Nov. 4, the state of Nevada ordered the U.S. Fish and Wildlife Service to return the water to its “historic path” within 90 days. The agency could face administrative fines of up to $10,000 per day until corrective action is taken. The U.S. Fish and Wildlife Service has 90 days to return water to Ministerio Roca Solida, a private church ministry located in the Ash Meadows National Wildlife Refuge, according to the state. On Nov. 4, the Nevada Division of Water Resources ordered the federal agency to cease diversion of water through the Ministerio Roca Solida parcel after the investigation found several violations of the terms of the ministry’s water permits. “Getting the water returned would be a major first step in making the ministry whole, after years of suffering litigation and egregious constitutional violations by the U.S. 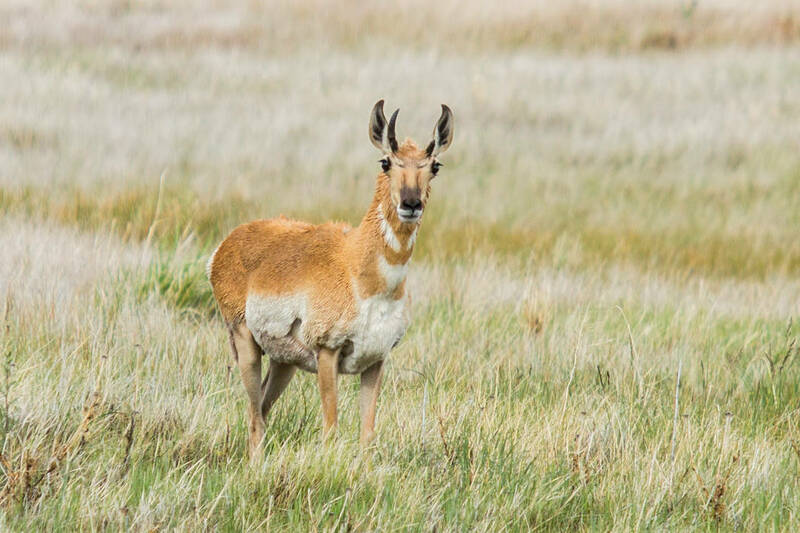 Fish and Wildlife Service,” said Joseph Becker, director of Nevada Policy Research Institute’s Center for Justice and Constitutional Litigation, who represents the Fuentes. Becker argued that the diversion of the waterway and taking of the ministry’s vested water rights was done without the Clean Water Act permits, in violation of Federal Emergency Management Agency requirements, and with no regard for the ministry’s use of the water for baptisms. The federal government, however, has denied any liability for the flooding and argued that the ministry had no rights to the water that had traversed its property. 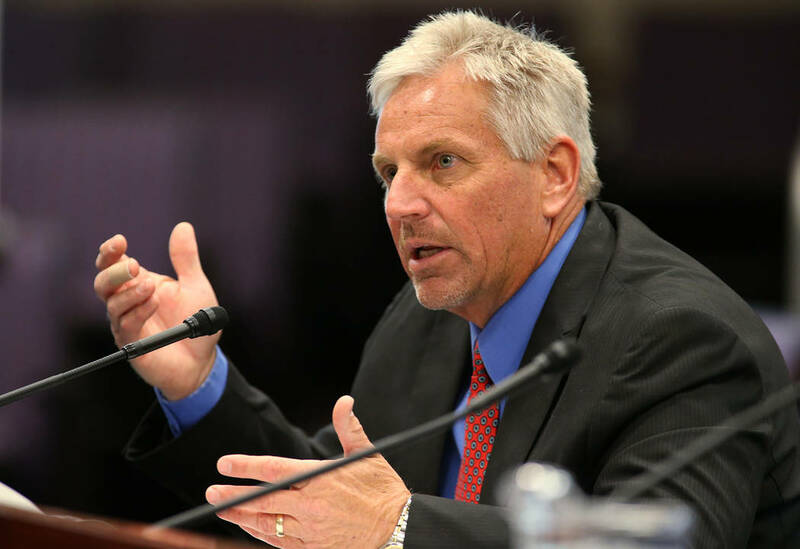 While the order from the Nevada Division of Water Resources verified the institute’s claim that the ministry’s vested water rights were violated, the ministry continues to suffer “significant damage and constitutional violations,” Becker said. “The ministry still suffered significant harm in the interim from the federal government’s actions, including repeated flooding and five years of flood damage resulting from the illegal water diversion project,” Becker said. He called the state’s order a boost to the “takings” case against the Fish and Wildlife that was brought by the Nevada Policy Research Institute for diverting water from the Ministerio Roca Solida. The case is currently pending in the U.S. Court of Federal Claims. “Although the USFWS said that its intention in acquiring those permits was to re-establish historic natural drainage courses within the refuge, the evidence presented by the Division of Water Resources demonstrates that the source of the Carson Slough historically traversed through the Solida parcel,” Nevada Division of Water Resources said in the documents. According to the order from the state, the U.S. Fish and Wildlife Service must return the water to its “historic path” traversing the church property, within 90 days, or face administrative fines up to $10,000 per day until corrective action is taken. Failure to take corrective action will result in the matter being referred for additional action available to the state engineer. Possible penalties for noncompliance can include payment of an administrative fine not exceeding $10,000 per day for each violation, replacement of not more than 200 percent of the water used, and payment of the costs of the proceeding, including investigative costs and attorney’s fees.